Alpana Station is just a hop step and jump away from Adelaide, making it a very do-able getaway escape. It is your ideal Flinders Ranges adventure destination! Alpana’s sixty thousand acre ‘big backyard’ includes the spectacular scenery of the Heysen, ABC and Trezona Ranges, big gum-lined creek beds, waterholes and pine-filled valleys, making it perfect for camping and exploring on foot or bike and four wheel driving. You will find the Alpana Station homestead 5km south of the historic town of Blinman which claims the highest Post Office in South Australia, the best example of Cornish mining technique left in Australia, the Big Kibble, as well as huge Miners Pasties, beef pies and Blinman Burgers. 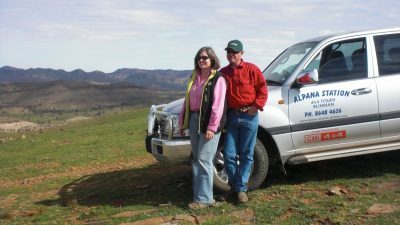 Alpana is just 55km north of Wilpena Pound, the geological jewel of the Flinders Ranges, and 35km east of the famous Prairie Hotel at Parachilna. Alpana Station offers scenic camping sites, powered sites with Ensuite bathrooms, self-contained accommodation in the very comfortable shearers’ quarters and the bush retreat serenity of Nungawurtina Hut. There’s plenty to do on Alpana with two self-drive 4WD tracks including the challenging Mt Samuel Track and the scenic Sunset Hill 665 track, guided 4WD tours in their luxury Landcruiser, tag-a-long guided 4WD tours, two marked walking trails plus acres of land and kilometres of creeks to explore on foot or mountain bike, an abundance of wildlife and birdlife, and never-ending photo opportunities around every corner. It is also a great place to relax and do nothing! Use Alpana as your perfect base to explore the property and surrounding central Flinders Ranges region. Visit the Flinders Ranges National Park, local gorges like Brachina, Bunyeroo, Glass and Parachilna, Mt Chambers gorge to the east, Public Access Route drives in your 4WD to mine and station ruins, and of course all the attractions of Blinman, Wilpena and Parachilna. After a big day there’s nothing better than a cold beer or wine with a meal and to sit around the campfire with friends and family admiring the millions of stars.